Take a cue from the expertsBilliards is a fun, casual game most associated with pubs and pool halls. But did you know that billiards has health benefits, too? A typical 2-hour session of 8- or 9-ball often involves about 100 trips around the table, and that equates to nearly 3/4 of a mile of walking. It also improves reaction speeds, sharpens problem-solving skills and builds teamwork skills. In short, the Barrington Billiard Table Set is an investment in your well-being and that of your loved ones.Designed for long-lasting durabilityThe Barrington Claw Leg Billiard Table, with its rich wood-tone finish and iconic green felt surface, delivers the classic feel that you have come to enjoy from professional-grade pool tables. A resilient 18mm deck promotes smooth, regulation-style play in your den or game room. Because we include everything that you need to start running the table, you can begin honing your trick shots even has you strengthen friendships and family bonds. This 23-piece set includes: our 90" table. 2 cue sticks. 2 chalk cubes. 1 triangle rack. 1 felt brush. 15 numbered balls. 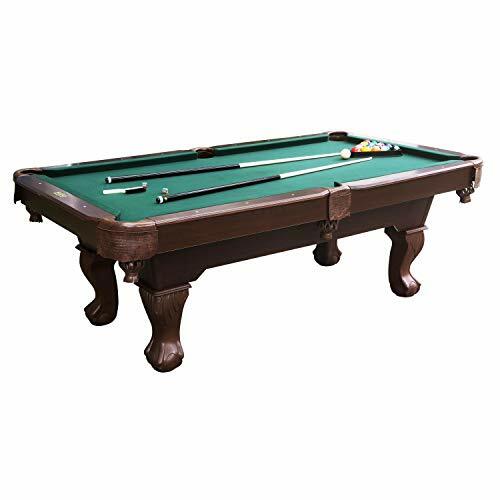 and 1 cue ball.Customer Satisfaction is our top priorityWe insist on the highest quality materials and craftsmanship to bring you this premium Pool Table Set by Barrington Billiards. We confidently offer a 30 Day Money Back Guarantee for your peace of mind. In the unlikely event that our product does not perform to your expectations, return it for a 100% refund of your purchase price. No questions asked.Engage the whole family in a fun, interactive skill game. Add the Barrington Claw Leg Billiard Table Set to your cart today.